Alberto Xavier Pereira Carlos was sworn in as Vice Minister of the Foreign Affairs, on October 22nd, by the President of the Republic. The ceremony took place at the Presidential Palace Nicolau Lobato, in Díli, in the presence of all the members of Government. 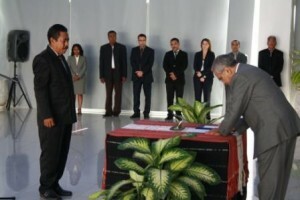 At the swearing in ceremony, Alberto Carlos stated: “It is an honour for me to be sworn in as Vice Minister of Foreign Affairs, as proof of the IV Constitutional Government’s trust, so that I may contribute, within my limitations, for the nation of whom I am privileged to be ‘a son and citizen”. Since May this year, Alberto Carlos was head of the national Office of the United Nations High Commissioner for Refugees (UNHCR) in Timor-Leste, post that already he had occupied before going to Sudan, in 2008, at the UNHCR service, to carry out functions as Camp Official. In 2005, the now Vice Minister of Foreign Affairs was also in Sudan, working as Protection Official in Emergency Operations for UNHCR with whom he started to work with in 1999. Graduating in Teaching and Education Sciences, Alberto Carlos participated in the Timor-Leste Emergency Operation in 1999 and 2006 (Voluntary Repatriation, Returnee Protection and Local Integration). He was also an International Refugee Law Instructor and Human Rights and Guest Instructor for Asylum and Human Rights for the PNTL Police Academy.